selling my Kjw kc02 has I barely use it and want the money to fund a new project comes with following: 1 co2 long mag leak free 1 green gas long mag leak free 1 mag without gas valve 2 hpa valve adapters Tanukiworks mp5 hpa adapter (the mag internals are in the adapter so can be removed and put back into the mag) also Has a quick detach connector fitted too Bipod Choice on colour grip an stock FPS was around 355 on 2s last time I chrono'd it (was a cold day and green gas doesn't do well in cold) Does not come with a scope or case 300 collected Or 315 delivered via ukmail Or would take a pistol in px plus cash my way. **** price drop £366 delivered **** Does not come with scope or bipod Got for sale my 9 month old action army aac01. Has been skirmished a handful of times and last chrono'd at 440fps (was a very cold day) Was set up on 3s but reset due to getting some 4s just not had chance to set hop on them yet. 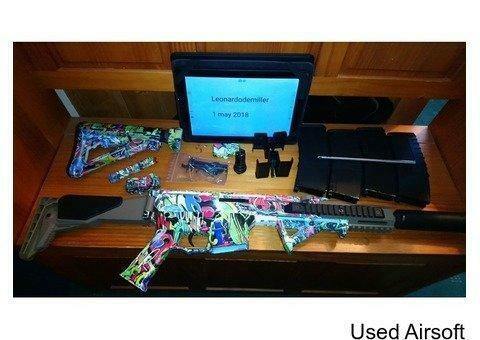 Comes with following: Action army aac01 3 28rd green gas mags all leak free some scuff marks from use. Sling Action army steel fluted power bolt A one off custom carbon fibre suppressor made by valhalla customs Original boxes has seen in pics Very clean rif and very nice to shoot too. Surprisingly Light weight for a wooden stock rif. With everything I've bought and the cost of the suppressor it's just over 600 pounds. I'm looking for 360 collected or 366 delivered. I'm selling has looking for money towards an silverback srs or I'm willing to trade plus alittle cash towards the right srs package.